Looking through my past reviews I was a little surprised to see that I have not posted a review of the Namakubi yet. I’m surprised because I really do like that cigar. Maybe I have another in a humidor and, if I’m lucky enough for that to be the case, I will get a review of that cigar up sooner or later. I was, however, able to find a review I did on the original Room 101 line, which I didn’t love. They are good, quality cigars but it just didn’t fit into my preferred flavor profile. So, what about the Daruma? 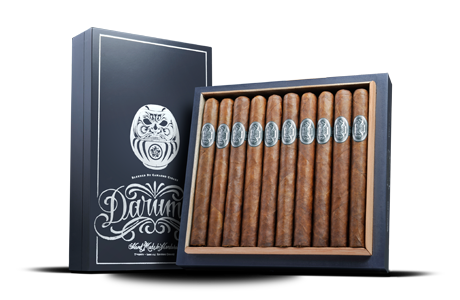 According to the Camacho website (Camacho makes Room 101 brand cigars and Camacho is owned by Davidoff – just fulfilling all possible fiduciary responsibilities and such) there are five different sizes. The cigar I am smoking for this review is the Roxxo, which measures in at 4″ x 48. The band is stylish and the cigar looks well made. Not very oily to the touch and this cigar is tightly packed. Very flavorful beginning to this cigar. There’s a rich sweetness that is buttressed by chocolate and some nice savory flavors. So far (first third = far), the flavor profile is complex and very enjoyable. The second third’s flavor profile is pretty similar to the first third’s. The good thing about this cigar is that the flavor profile has taken on a granular feel to it. It’s going along at medium bodied. Chocolate is gone during the final third but the savory and sweet flavors are still kicking around. The savory flavor is close to tasting like an aged steak and the sweetness is close to floral. Very good mixture of flavors and even though there isn’t a lot a change in the flavor profile from beginning to end there is a good amount of flavors going on throughout that I never got bored with this cigar. Medium bodied with a good draw and burn; this cigar will probably have a certain amount of appeal to just about everyone. This isn’t a cigar that beats you over the head with very strong individual flavors but, taken in totality, it’s very pleasant and interesting.